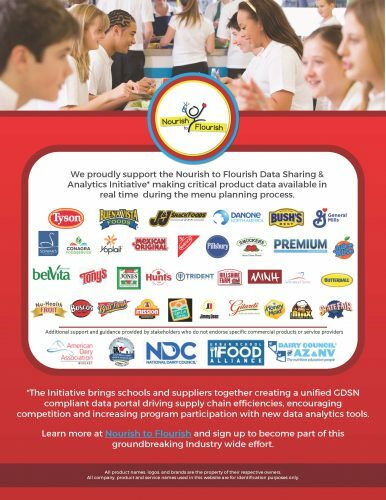 In March 2017, the National Dairy Council and the Urban School Food Alliance convened a national Nourish to Flourish (N2F) summit of 240 thought leaders and stakeholders committed to the nourishment and well-being of America’s children. The Data Sharing & Analytics Work Group was charged with finding ways integrate technology into the child nutrition ecosystem to drive participation. This initiative leverages GDSN supply chain technology to simplify burdensome regulatory tasks and facilitate data insights for both suppliers and schools. The secondary initiative is focused on Mobile App Integration into trade and consumer daily activities. The Streamlining Procurement Work Group aims to maximize efficiencies in the procurement process by aligning stakeholders around the common application process for the ultimate benefit of student health and performance in profitable relationships with industry partners. The Improving the Dining Experience Work Group provides a fun an interactive space where the school community gathers for culinary excellence–darn good food. This place supports mind, body and soul through exercising all components of healthy lifestyle choices. It’s a customizable and adaptable space that fosters a sense of community and allows to refuel and recharge. Pilot Testing: Several Nourish to Flourish work groups are now advancing their innovations into the pilot stage with collaborative efforts engaging multiple stakeholders to test, refine and launch innovations to “scale up excellence in school meals.” Pilots will test the viability and answer important questions. There are opportunities to join the effort by participating in pilots now being organized.